There’s a lot more to interviews than just being well-spoken. Having all the right answers might seem like a sure-fire way to land a job, but there’s an equally important element to interviewing: body language. Nonverbal cues, such as facial expressions and eye contact, play a large role in the communication process and can help you soar or be your downfall. 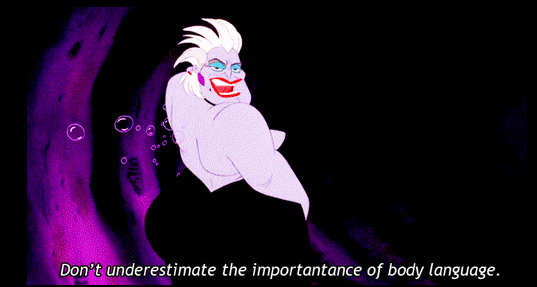 Take it from Ursula: Don’t underestimate the importance of body language. According to kinesics, the study of how body movement serves as a form of communication, up to 80% of the meaning in a message is communicated nonverbally. That’s a significant part of the communication process that is completely unspoken! It’s not just what you say, but how you say it. Aside from word choice, there are several other factors to be mindful of when you’re looking to land a job. Your facial expressions help a person understand a lot about you. A smile can convey to hiring managers that you are interested in what they are saying, and you’ll present as a friendly, open candidate. But you have to be careful as an inauthentic or forced smile can completely undermine your actions. Lack of a smile, or a stoic expression, will make employers think you are disinterested or bored. Slouching during an interview is a big no-no. This can make you seem distracted, or even lazy, which is not an impression you want to relay. On the opposite side of the scale, being too rigid can project nervousness, and crossing your arms can seem aggressive. It’s best to sit in an upright, relaxed manner to show employers you are alert and ready to hear what they have to say. Maintaining good eye contact is the best way to signify your interest. Additionally, nodding can show you understand or agree with what is being said. Sometimes maintaining eye contact can be uncomfortable -and if this is an area in which you struggle, spend time working on this. Avoiding eye contact, “shifty eyes”, and even rapid blinking can convey dishonesty and nervousness. A handshake is usually the only physical contact you’ll have with an interviewer –therefore it’s something they are likely to remember. You can probably recall an instance where someone gave you a limp or uncomfortable handshake, and it might even have made you feel uneasy. A good handshake doesn’t always stand out, but a bad handshake will certainly leave a lasting impression. Opt for one that is firm and doesn’t linger too long. Hand gestures are also a great asset to your communication. You can use them to emphasize a point and portray confidence -just try not to overdo it. Certain gestures and movements can also detract from the professional image you are trying to portray. Rubbing your hands together, picking at your skin, fiddling with a pen, or playing with your hair tells the interviewer you are distracted and uncomfortable. Additionally, drumming your fingers on surfaces and fidgeting will make you seem easily distracted. To sell the part you have to look the part. Use your judgment when dressing for an interview: no t-shirts with graphics, ripped jeans, sneakers, revealing attire, etc. Even if you are interviewing for a causal role, it’s best to still dress in neat business attire when you meet an employer face-to-face for the first time. You’ll gain a better understanding of the required dress code for your desired position by taking note of what other employees are wearing, then adjust your look when you land the job. It’s better to be overdressed than underdressed. When preparing for your next interview take time to think about what your body language is saying. Your unspoken actions carry just as much weight as your words, and learning how to carry yourself in a confident manner will make all the difference in your job search.